The anime adaptation of the hit shoujo manga is here, and its premiere does not disappoint. Prepare your heart for a summer full of feelings! But before we get to that, let’s have a quick meet ‘n’ greet to see who’s working on this little series and where y’all can check it out. And speaking of spoiler alerts: Everything past this point assumes you’ve already seen the episode and know what happens. Please read responsibly. 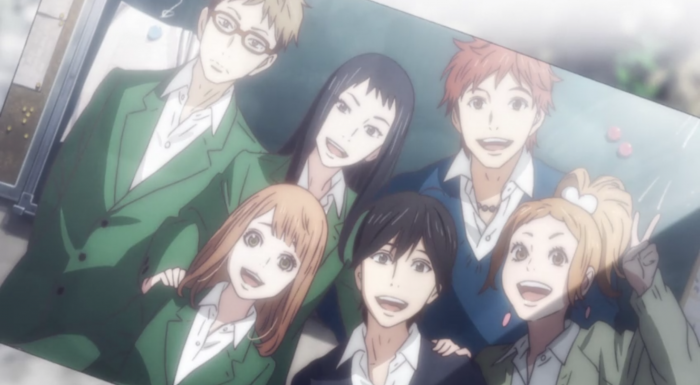 I’ve read the orange manga (also available on Crunchyroll if you’re impatient) and am a fan of its emotional, character-driven story, so my requests for this adaptation were pretty simple: A polished production that kept the central story intact and used its art and music to enrich the experience. So far we’re solid on all counts. The art is lush, with a bright, natural color palette, a focus on realistically expressive faces (the smiles stretch and crinkle beautifully), and a good use of slanting sunlight to bathe scenes in a combination of joy and nostalgia that fits the story well, given the time travel elements. The entire episode is built on this contrast, in fact, shifting from quiet reflections to energetic montages in a way that can be almost jarring. 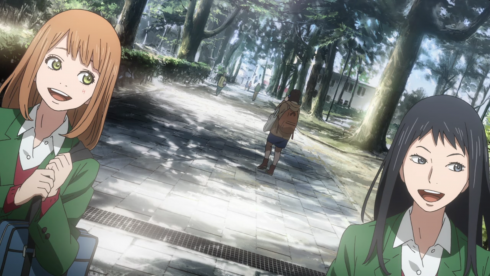 And maybe it’s supposed to be, seeing as how orange is itself juggling two story lines: The immediate experience of high school for our young Naho, and the wistful memory of high school for her 10-years-older future self. Those dual perspectives help form one of the main threads of this episode: regrets, and how best to live our lives. Our protagonist is insecure and reserved, preferring to avoid conflict and keep herself out of the spotlight, qualities that lead her to make decisions her future self promises she’ll regret. While there’s no guarantee that the path she didn’t travel will be better than the one she did, she can at least make the choice to act rather than sit quietly and watch the world move by without her. The letter serves as a reminder to live more courageously, to be willing to try and fail rather than wonder “what if” years later. Above: Naho, age 27, still waiting on George R.R. Martin to finish writing Game of Thrones. That courage also extends to the second major thread of this premiere: Communication and honesty. 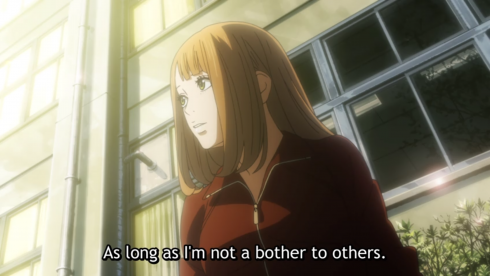 In a quietly painful moment that alternates between contrasting long and close shots (showing how the characters have grown close but still can’t know everything about each other), Naho says she’d rather just “endure” pain than “be a bother to others.” She doesn’t think her pain will be a problem as long as she keeps it hidden, a dangerous attitude (and one that hits me hard in my own high school memories, come to think of it). But keeping something hidden doesn’t make it go away–Naho’s ankle will still have that blister–and sometimes being speaking up is the only way for someone to get what they really want or need. 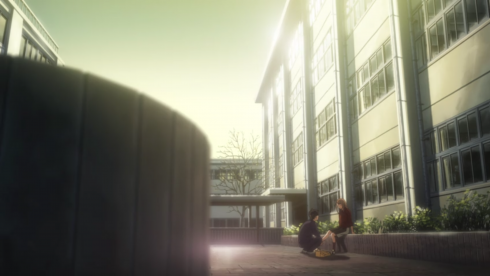 “You have to say so,” Naho tells Kakeru. The chemistry between these two is immediate and they pay close attention to each other as a result, sometimes guessing at the other’s thoughts, but there are still things they can’t know without words. 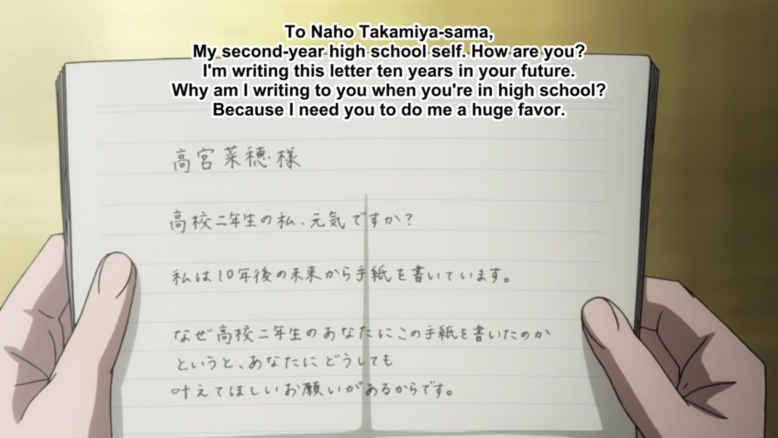 Finding those words for someone as shy as Naho may prove to be a tough challenge going forward, letter or no letter. 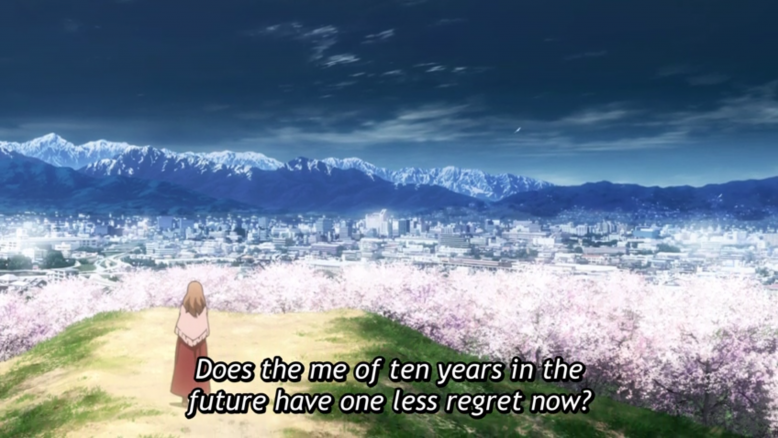 While the ongoing mysteries (why did Future Naho send the letter? what was so bad about inviting Kakeru to hang out? why was Kakeru gone for so many days?) 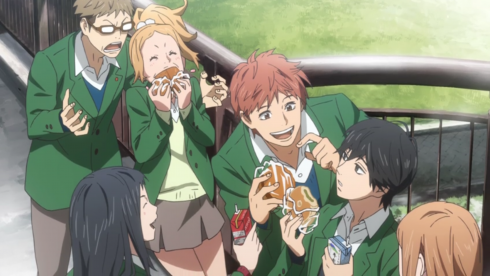 help drive orange forward, the story of Naho, Kakeru, and their friends is something of a slow burn, but one that builds well on itself, gradually developing relationships and unraveling mysteries as it goes. Like most shoujo/josei titles, its greatest strength is the bonds between its central cast members, and this premiere does a great job of establishing the characters and their relaxed, lively relationships through actions and dialogue alike. All in all I was very happy with this premiere and look forward to seeing how Hamasaki’s team continues to bring the manga to life, layering their own voices and visions atop the core story and using those bursts of spontaneous playfulness to help keep new viewers engaged. I’ll have to give it a couple more episodes to prove its staying power, but there’s a real good chance it’ll make both the season watchlist and the blogging schedule this summer. Seeing as how I don’t have a letter from my future self, we’ll just have to wait to find out.